As a custom framer you know that the little things aren’t always so small. For example, your design experience and attention to detail tell you when a slight adjustment to the width of the mat or the scale of the frame will take a project from ne to fabulous. This is one of the reasons people come to custom framers to display their treasured pieces. The business side of custom framing is no different in this regard. 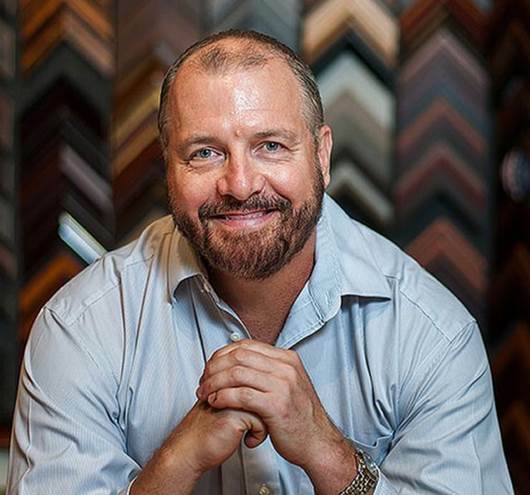 For many custom framers I work with, including Tru Vue Retail Makeover Contest winner Sheri Wright, opportunities for increasing profitability begin with small changes. Huge increases to pricing or major efforts to draw more customers often are unnecessary. The following are two ways I frequently recommend to make minor shifts for major impact: design-driven sales & correct pricing. Let’s say you are like Shop C from our frame shop examples in our earlier articles in this series (click here to read the first article). You have a good handle on where your pricing needs to be to make a profit. You discount at an appropriate rate that doesn’t hurt your average ticket price. But you are still leaving opportunity on the design table by holding back on upgraded materials and premium design techniques. Presenting options to clients that include things like anti-reflective glazing, floating mounts and stacked frames are examples of ways Shop C, and those like it, can raise average ticket price. In addition, showing customers the best you can give them is a great way to increase satisfaction and inspire word of mouth. Research shows that customers come to the professionals because they offer a higher level of expertise, design skill and craftsmanship. If you are concerned about sticker shock, you might be interested to know that focus group research shows customers prefer to be given options and be free to make their own choices about upgraded materials (view the Focus Group Article or Focus Group Videos). In fact, if people feel that the value of their piece is being judged or a business owner is making assumptions about their budget, they can quickly become o ended. That’s the last thing you want to do to a customer. Early in this series, we emphasized the importance of basing pricing on how much it costs to run your business because a one-size-fits-all approach doesn’t work for most shops. Further customization by adjusting multipliers within your POS system takes this a step further to boost profitability. One tactic we have referenced before is changing multipliers on materials depending on how frequently they are used. For example, the most common custom framing projects are 16”x20” and smaller. Increasing the mark-up on these more popular, less expensive projects allows business owners to decrease the mark-up on the larger, pricier projects where a higher multiplier is more noticeable. For example, working with Sheri during the Tru Vue Retail Makeover, we came up with a plan that enabled her to raise the average ticket price by $18, resulting in an additional $22,000 over the course of a year with just a minor adjustment in her pricing structure. Without adding customers, the gross margin would increase four percent in the 12-month period. A future article in this series will go into more detail on the various ways you can customize multipliers to increase profitability. When you show subtle changes to clients at the design table, you can see that “light-bulb” reaction when they realize the potential their piece holds. In the upcoming posts in this series, we want to illuminate the bulb for you with step-by-step instructions and specific examples for how to make small adjustments to your pricing that result in big changes for your business.